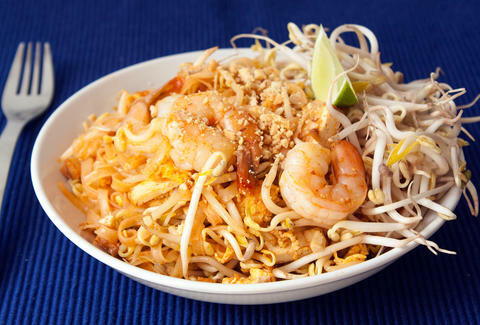 It's hard to find authentic, Bangkok-style pad Thai outside of Thailand, because the ingredients are also hard to find outside of Thailand. The takeout version you're used to eating probably doesn't have tamarind, palm sugar, banana flowers, and preserved radishes in it -- but that doesn't mean it isn't delicious and that you haven't ordered it so many times that your local Thai spot should sponsor your Netflix binges. 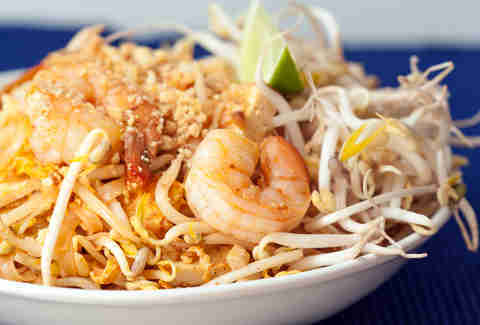 This recipe comes from my mom, who has opened four Thai-American restaurants in her lifetime and makes the best nontraditional pad Thai. You might say I'm biased, but you'll agree once you make this for your seventh viewing party of First Day of Camp. Place the noodles in a large bowl and cover with cold water. Soak for 30 minutes, drain, and set aside. Heat oil in a wok or large skillet over high heat. Pour in the eggs and cook, stirring, until loosely set but still wet. 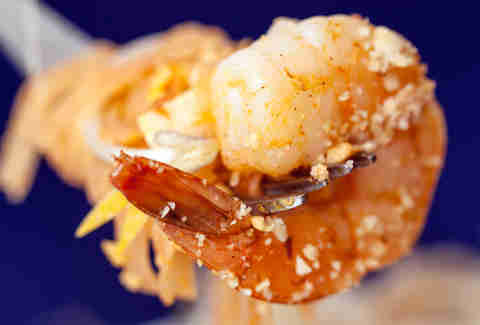 Add shrimp and tofu; cook until shrimp is opaque. Stir in fish sauce, vinegar, sugar, and paprika. Cook for 1 minute then add drained noodles. Cook, stirring often, until the noodles are tender, about 3 to 5 minutes. Stir in half the bean sprouts and scallions and remove from heat. Sprinkle peanuts on top and serve with remaining sprouts and lime wedge.